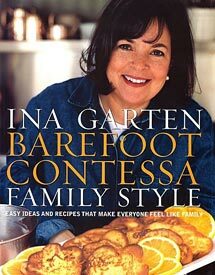 This is delicious and unpretentious food—the recipes that please Ina Garten’s family and friends at home in the East Hamptons. Of course we love the recipes, but we also love the beautiful, clean design, vivid photographs of the prepared dishes, and Ina’s serving suggestions. Her seasonal menu suggestions are an inspiration. This is the kind of fresh, accessible food that’s meant to be passed around the table in big bowls or platters. Ina’s East Hampton Clam chowder with Fresh Clams and Vegetables, Roasted Asparagus and Linguine with Shrimp Scampi, and Raspberry Cheesecake—this is the food that great, casual meals and parties are made of. If you’re looking for a cookbook chock full of easy, elegant food for everyday entertaining, or just ways to make family mealtime a little more special, than this is it.